Johnny A. Interview with Everyone Loves Guitar where Johnny discusses his history; playing with Bobby Whitlock, Peter Wolf, The Yardbirds, The Streets, his signature guitars, and "Just Me and My Guitars." Rig Rundown with Johnny A. Premiere Guitar magazine just released a new Rig Rundown with Johnny A.
OK...here 'tis: I am NO LONGER associated with The Yardbirds. On July 18, 2018, I received "The Yardbirds will not be needing your services any longer" email from the powers that be. I feel I have a responsibility and obligation to alert fans/promoters that may be considering investing hard earned monies on a Yardbirds' performance expecting me to be appearing with the band. I WILL NOT BE APPEARING AT ANY FUTURE YARDBIRDS' PERFORMANCES! I wish to thank ALL of my loyal fans that supported me during my tenure with them. I wish only the best of luck for the Yardbirds going forward. Great article on Johnny and his looping techniques in the new Guitar Player magazine hitting newstands this week! Johnny plays the classic Rolling Stones song, Play With Fire, live - with no backing tracks and looping on the fly! By merging timeless tone and taste with utterly contemporary technique, Johnny A. has earned a reputation as one of the most talented guitarists working today. The original Johnny A. Signature guitar became one of Gibson Custom’s most popular artist models right from its unveiling in 2003. Now the new Johnny A. brings the same blend of classic appointments and original design forward with a host of great new features, in a superbly versatile new semi-acoustic electric guitar that you’ll want to call your own. Gibson Johnny A. Signature - click here for more information. Epiphone Johnny A. Signature - click here for more information. Limited edition 180g audiophile vinyl - Hand gold-foil stamped numbered edition of 500 pieces, pressed and plated at Pallas Germany. Includes a digital download card- now available to order online. Very limited availability - click here to order. 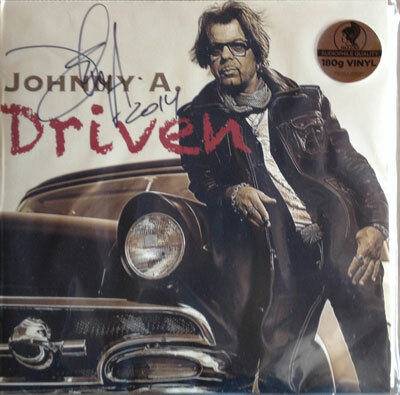 Shop for Johnny A. albums and merch here!